Easter will soon be here, and even in Kitwe, hot cross buns and Easter eggs can be found in the supermarket. Many over here, of course, won’t have the opportunity to try either of them! Recently I have been thinking about Maslow’s triangle. For those of you who are not familiar with it, this is a diagram depicting human needs. 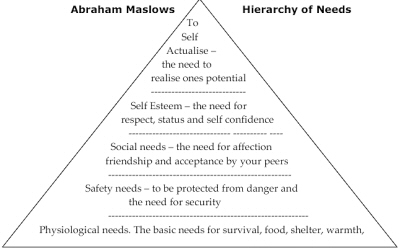 Maslow’s theory is that you have to satisfy needs at the more basic level before you can move on to the next one, eventually aspiring to the pinnacle which he calls self actualisation, and I suppose I would call communion with God, or harmony with His purposes. When I was practising social work in Somerset, mostly I worked at the social needs and self esteem level, although there were times when my main concern was for the safety of the people I was working with. 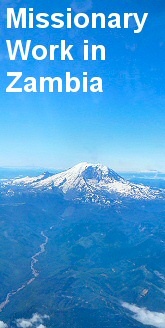 Here in Zambia however, I am reminded I am working at the very basic level by two incidences. The first being a survey I carried out with the women at Ipusukilo in order to measure their progress, and the second involves my visits to the children on the Lwansha road farm. Both humbling experiences. The women at Ipusukilo had never filled in a survey before, and there was a great deal of discussion and deliberation about each point, number of people in your household, for instance, “does that include dependants who live on the farm?” Items you consider valuable in the house, “chair” “mattress”, “chickens” (and yes, the chickens are in the house). 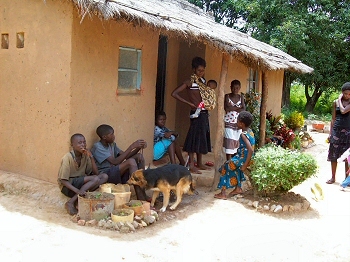 Estimated weekly income, 8 said less than 20,000 Kwacha. ( 7,500 Kwacha to the pound). The other poignant example of how people exist at the level of basic needs is the group of children I mentioned in my Christmas newsletter. They cling on to the basic needs of food shelter and warmth. Although they were left a nicely appointed thatched house by their grandmother, the roof leaks and they have difficulty in finding enough food before the ripening of the maize crop in May. On my first visit I also noticed they did not have enough blankets, which, with the onset of the cold dry season, was a cause of concern. Thankfully my neighbour Bob was able to procure some blankets on a visit to Lusaka and we delivered them to the children before the nights started to get cold. After discussing with an auntie, Gladys, who has come to look after them, they decided that the best way forward would be to plant tomatoes onions and cabbage for selling. But life will still be very much on the edge for this small community. The tie and dye sessions went down very well with the group in Kamatipa. They are now trying to launch a small business, and Mindolo Ecumenical Foundation may be able to assist as they have a number of sewing machines which can be utilised to teach them tailoring. (If we can find a teacher that is, - my tailoring skills go no further than sewing on a button!) I am also quite excited as I have come across a solar oven that seems effective, cheap and easy to make, although it is limited by its funnel shape to the amount of food that can be cooked or water that can be purified at any one time. The website says it can also be used as a fridge overnight! For those technos amongst us the website can be visited here or you can Google funnel solar cooker Steve Jones BYU.